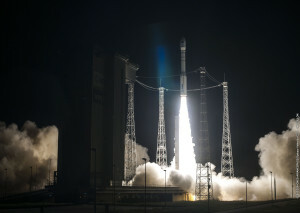 Arianespace orbited the Sentinel-2A satellite on its fifth launch of the year, also the fifth launch overall by Vega, the latest member of its launcher family. Sentinel-2A is the second satellite from the European Commission’s Copernicus program to be launched by Arianespace, under a contract with the European Space Agency (ESA). Sentinel-2A lifted off on June 22 at 10:51:58 pm local time from the Guiana Space Center (CSG) in Kourou, French Guiana. Sentinel-2A is the second satellite from the Copernicus program to be launched by Arianespace for the European Commission, under a contract with the European Space Agency (ESA). Built by Airbus Defence and Space as prime contractor, this optical Earth observation satellite is mainly designed to monitor land masses and coastal areas across the planet. Copernicus is the European Commission’s second space program, following Galileo. It aims to give Europe continuous, independent and reliable access to Earth observation data. The Copernicus program spans a wide range of missions and services, allowing us to better control and protect our environment, and better understand the phenomena underlying climate change, while also improving the safety and security of European citizens. Over and above the Copernicus program, for the last 35 years Arianespace has supported sustainable development by launching satellites dedicated to environmental protection and monitoring, meteorology and navigation. Sentinel-2A joins the 45 satellites already launched by Arianespace for these applications over the last three decades. Technological development with the IXV (launched by Vega on February 11) and scientific exploration with Lisa Pathfinder (to be launched by Vega in the second half of the year). Navigation: three Galileo missions (Soyuz – March 27, then in September and December). Secure communications: Sicral-2 (Ariane 5 – April 26). Environmental protection and meteorology: Sentinel-2A (Vega – June 22) and MSG-4 (Ariane 5 – scheduled July 8). target of three launches in 2015. Following the IXV launch in February, and the Sentinel-2A launch today, the Lisa Pathfinder satellite will be orbited by a Vega rocket by the end of 2015. This operational success goes hand in hand with the launcher’s breakthrough in recent months in the Earth observation market. Vega has won new export contracts, which now account for more than 70% of its order book value. Arianespace has signed three new launch contracts since the beginning of the year, including one for two Falcon Eye satellites for the United Arab Emirates, along with the Perusat-1 satellite for the Peruvian government, and a group of Skybox satellites for Google/Skybox Imaging. Arianespace’s purchase of a batch of ten Vega launchers in October 2014 from the ELV consortium, comprising the manufacturer Avio and the Italian space agency ASI, reflects the market’s confidence in this launcher, which joined the Arianespace family in 2012.